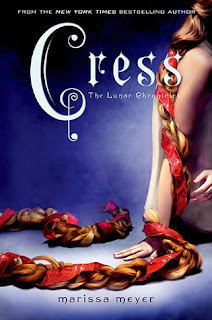 My pick is Cress by Marissa Meyer! Rapunzel’s tower is a satellite. She can’t let down her hair—or her guard. Their best hope lies with Cress, who has been trapped on a satellite since childhood with only her netscreens as company. All that screen time has made Cress an excellent hacker—unfortunately, she’s just received orders from Levana to track down Cinder and her handsome accomplice. I LOVE this series so much! Marissa Meyer puts such a unique twist on fairytales. And Rapunzel is one of my favorite fairytales, so I'm especially excited for this one. Cress releases on February 4, 2014. I have the first two on my bookshelf and I am waiting to read them as I have heard nothing but amazing things! I'm holding off until Cress so I don't have to wait for it if I end up loving the first two - which I am sure I will! My WoW.